A lot has happened theses past two weeks! 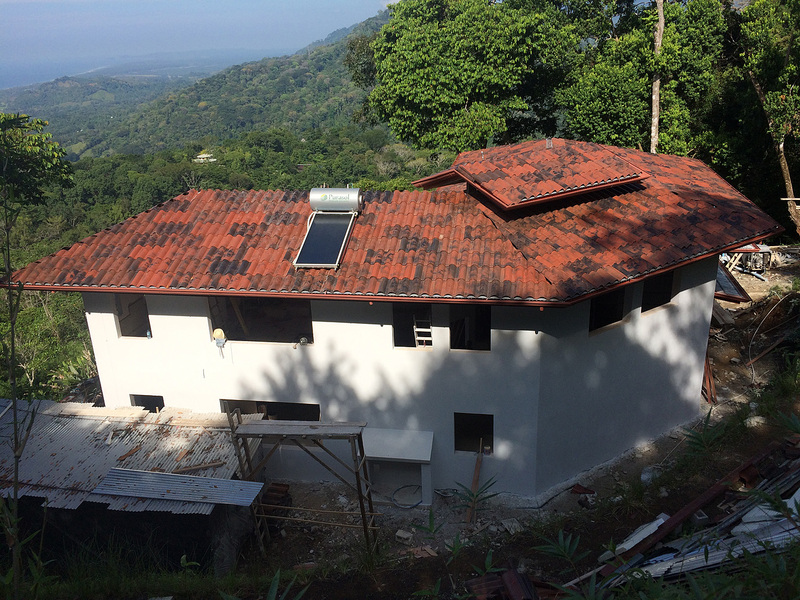 The roof tile has been installed along with the solar hot water system. The solar company originally was scheduled to install the system in January, but they had a cancellation and asked if they could do the installation this past Friday. Fortunately, that part of the roof had already been completed, so it worked out for them to do it. 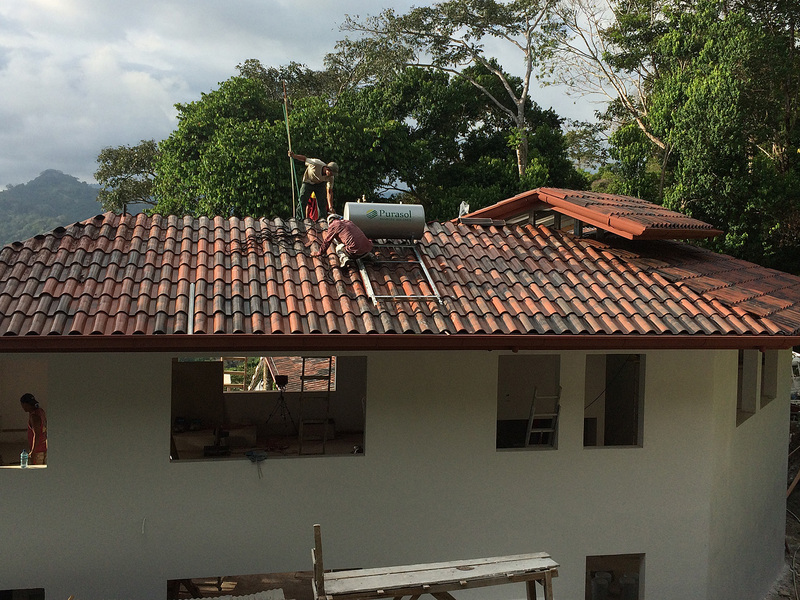 Interestingly, they came prepared to install the system on a flat roof not a tile one. Not too many people have flat roofs here, so Eddie was surprised that they weren’t prepared. Our workers saved the day. They welded a frame on which the solar panel could rest. It took quite a while to construct. As a result, the system installation took longer than they anticipated – an all day affair. Eddie came up with a good idea to protect the PEX lines from the sun by using air conditioning line insulation. 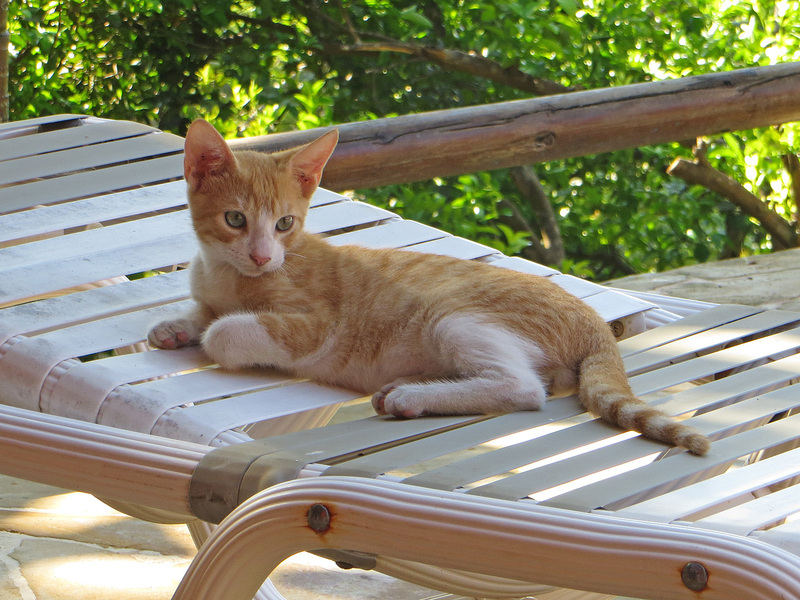 The next day, he climbed up on the roof and did that work himself. 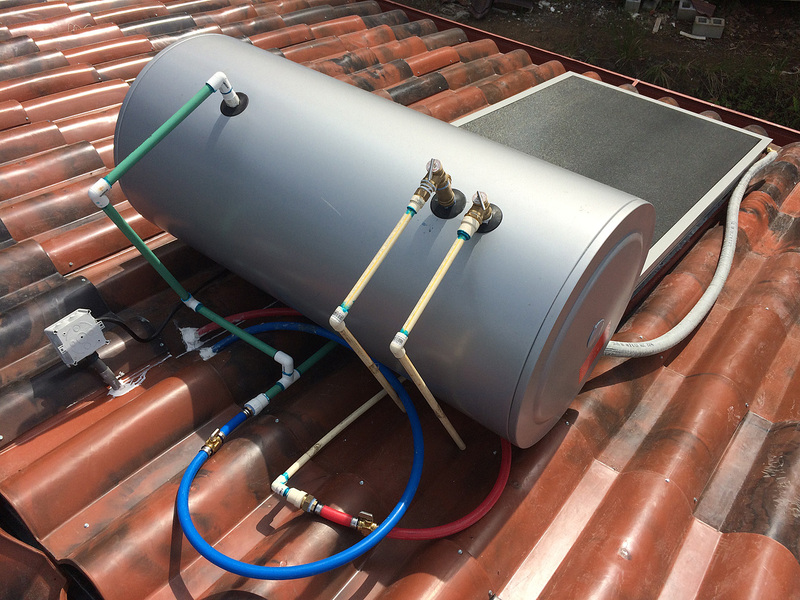 Installing the solar water heater. All connections are complete. PEX lines (red & blue) to get covering to protect from UV rays. 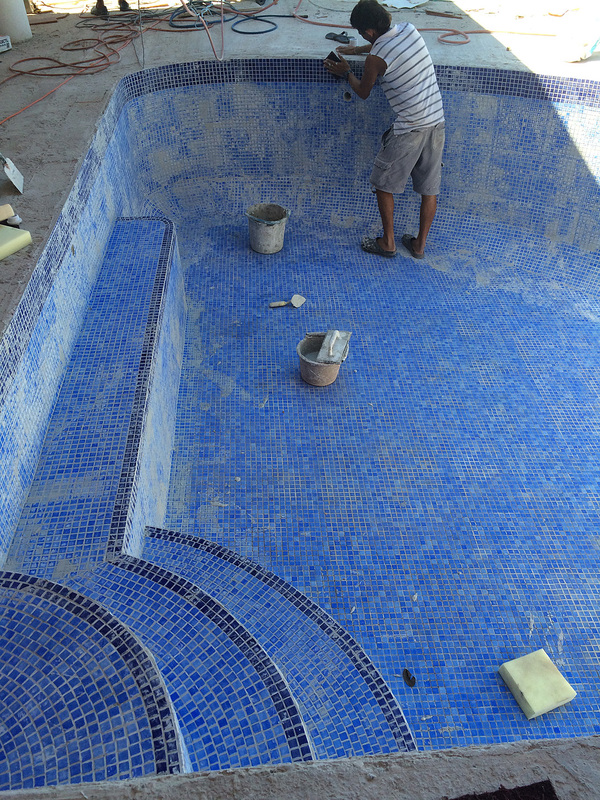 The pool tile has been installed as well and now the guy is working on grouting it. It looks awesome! Our foreman’s young son has been up at the house this past week. He told me he is excited about swimming in it. He wanted to know when it would be ready. Eddie and Edgardo (our foreman) installed the PEX distribution manifold for the water lines. Eddie has been teaching him how to work with the PEX system. Edgardo and his father have expressed an interest in using PEX in some of their other projects. Eddie told them he would help them with ordering, importing and installing. 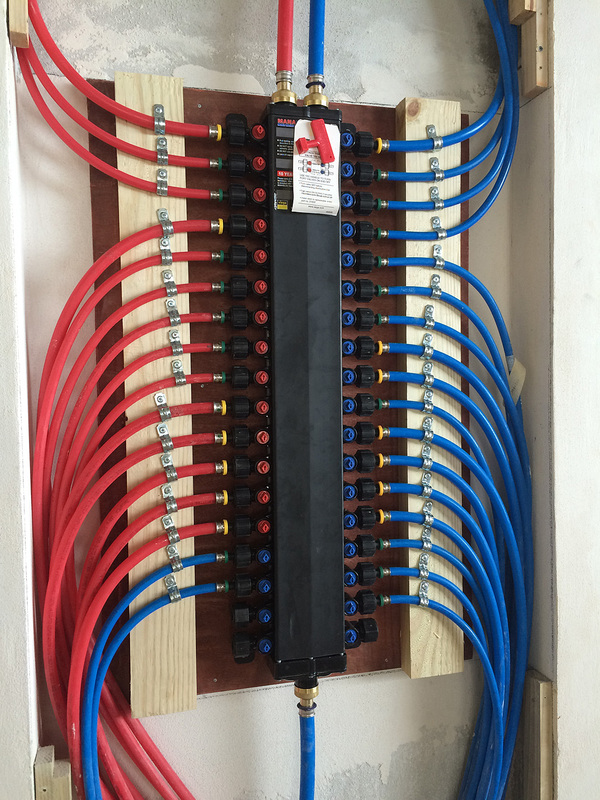 PEX distribution manifold for hot and cold water lines. Things are really moving along now with the interior space. 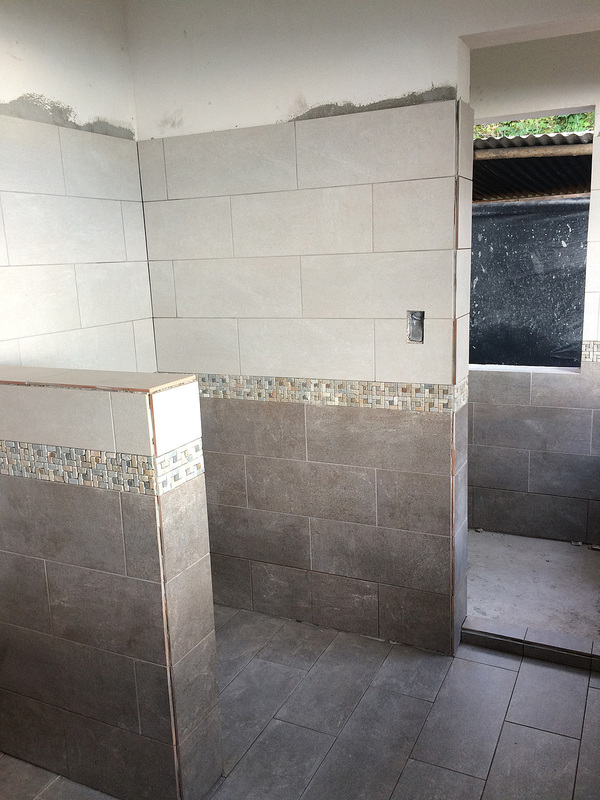 The tile guys finished working on the master suite bathroom and have started working on the guest suite bathroom. 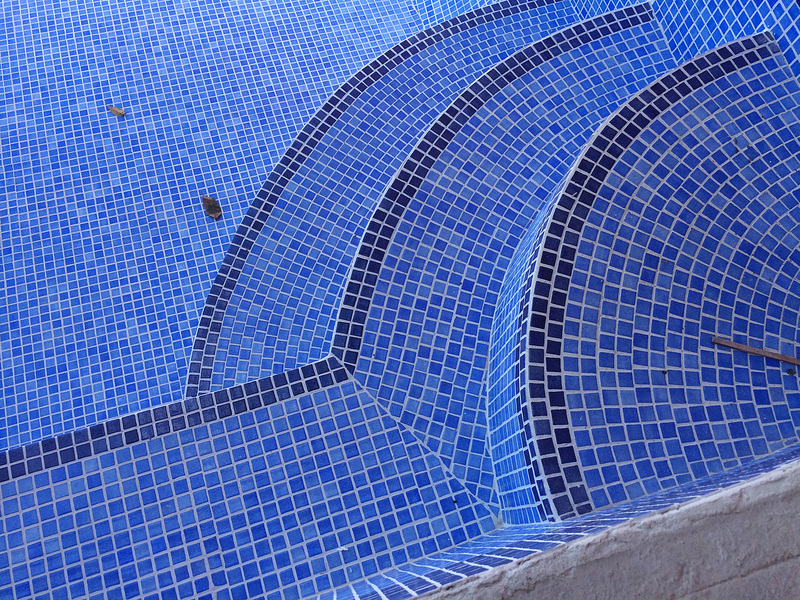 Eddie and I are very pleased with both the tile selection and its installation. The guys are doing a fantastic job! The other day they started tiling the main floor both upstairs and downstairs. It’s looking beautiful! 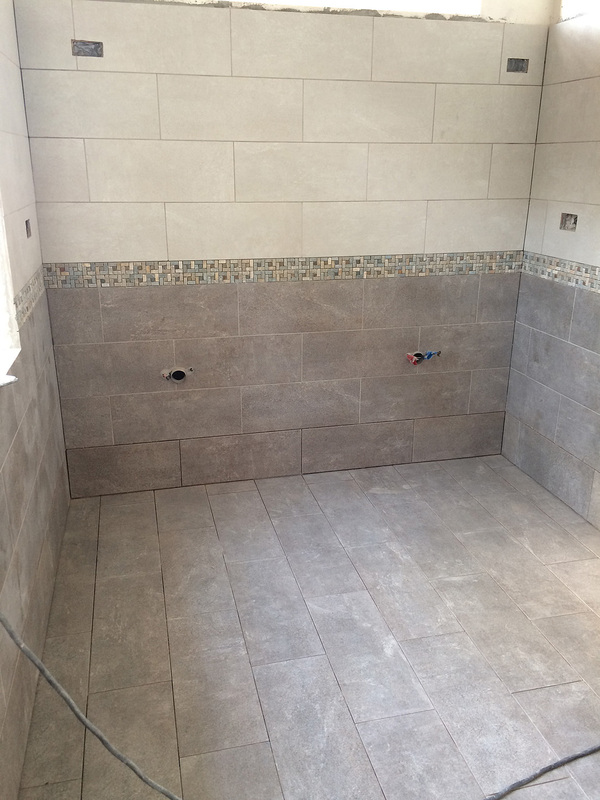 Master bath tile work underway. 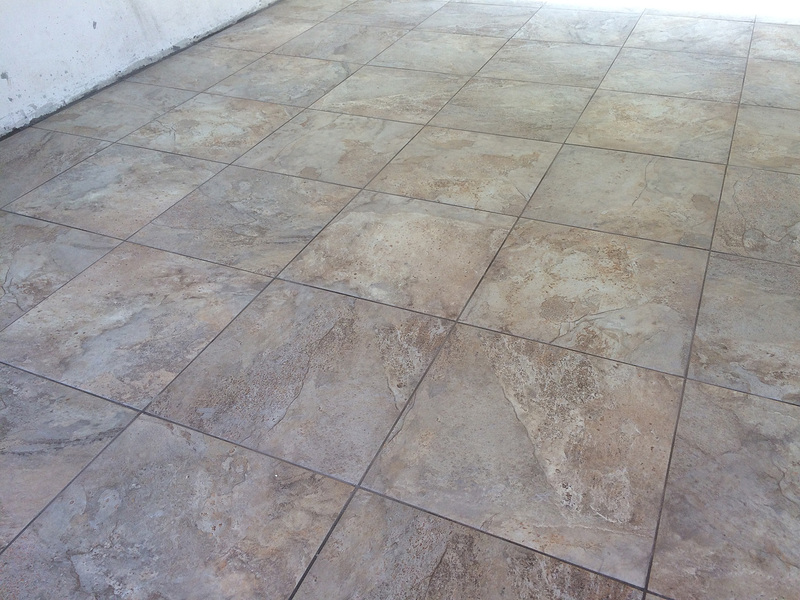 This is the floor tile we are using in most of the house. The metal worker making our banister for the staircase that leads up to the guest suite came by on Monday with his crew. 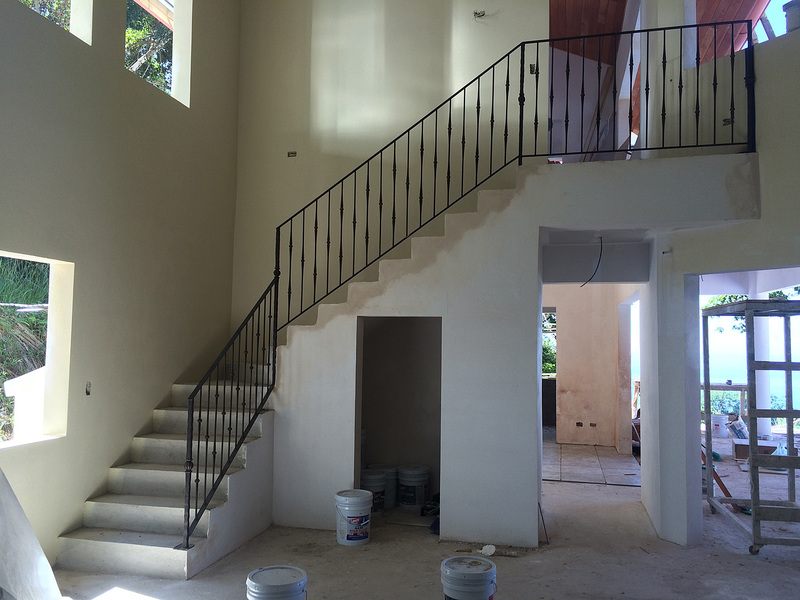 It took them all day to weld the wrought iron pieces together, attach it to the stairs and paint it. It was painted black and then a bronze finish was applied. It’s absolutely gorgeous…a true piece of art! 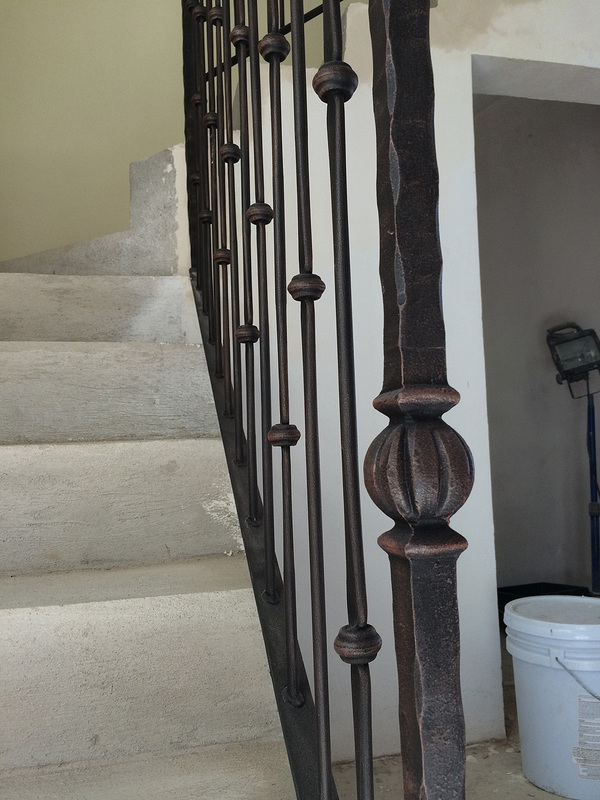 Wrought iron stair railing has been installed. It will have a wood hand rail as well. 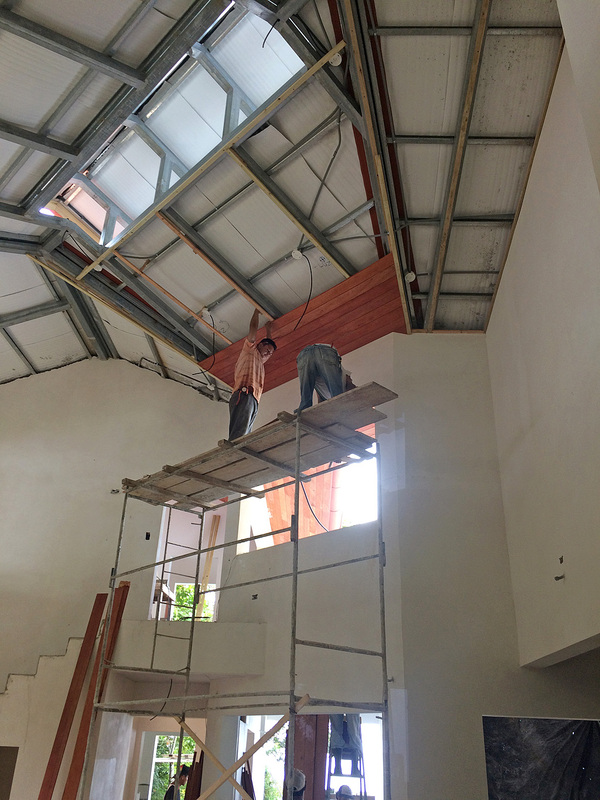 The workers continue to put up the wood tablilla on the ceiling. They are now working on the two story section of the house. It’s a lot of space to cover. Last week, we visited the cabinet maker who is working on our kitchen, both bathroom suite vanities, interior doors, side outer door and the main door. 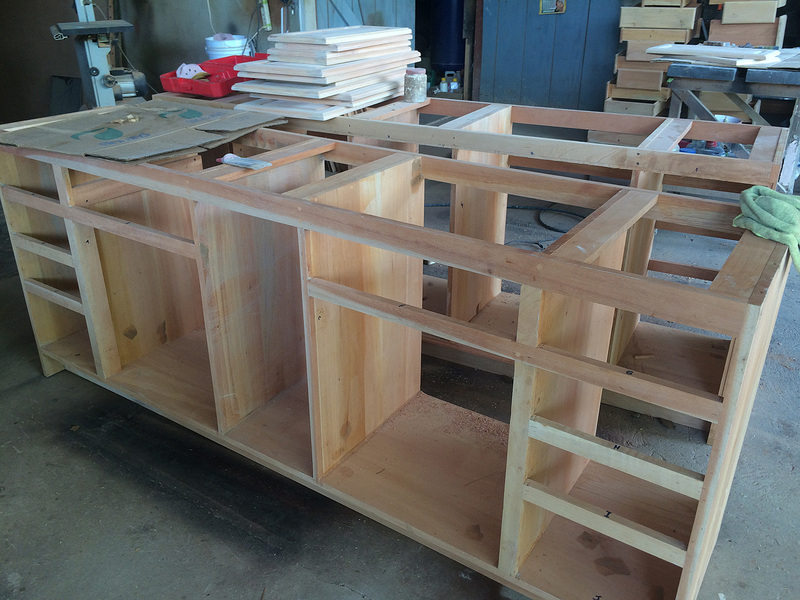 He and his workers have completed the frame for the kitchen island and both bathroom vanities. 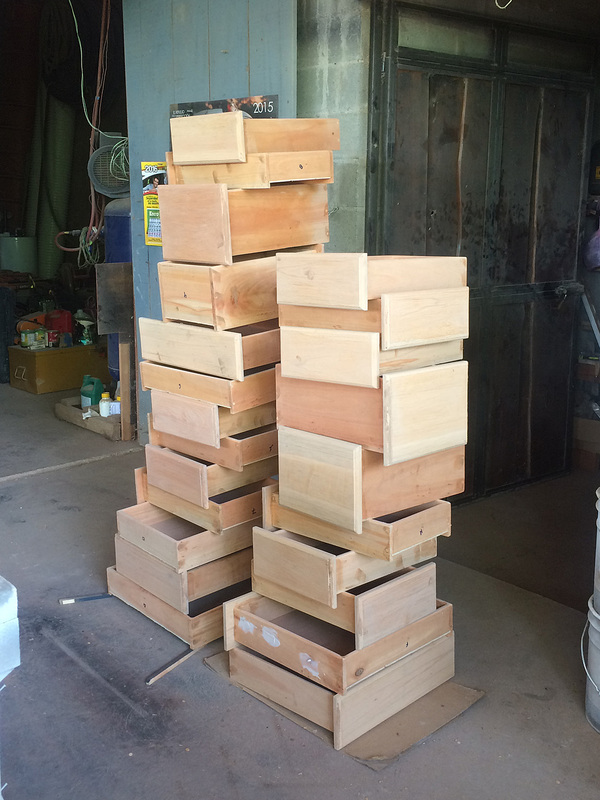 They had some of the doors and drawers finished and were in the process of sanding them. Everything looked great so far. Eddie asked them to begin working on the two outer doors next so that they will be ready when the windows and the patio doors arrive and are installed. That way we can secure the house. The bathroom vanity frames are in process. 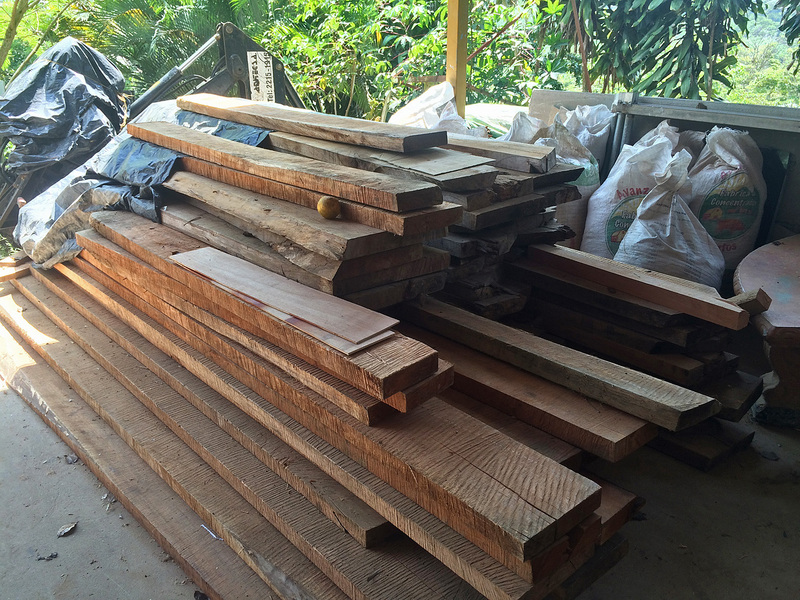 Raw lumber (Cedro Amargo) for the doors. 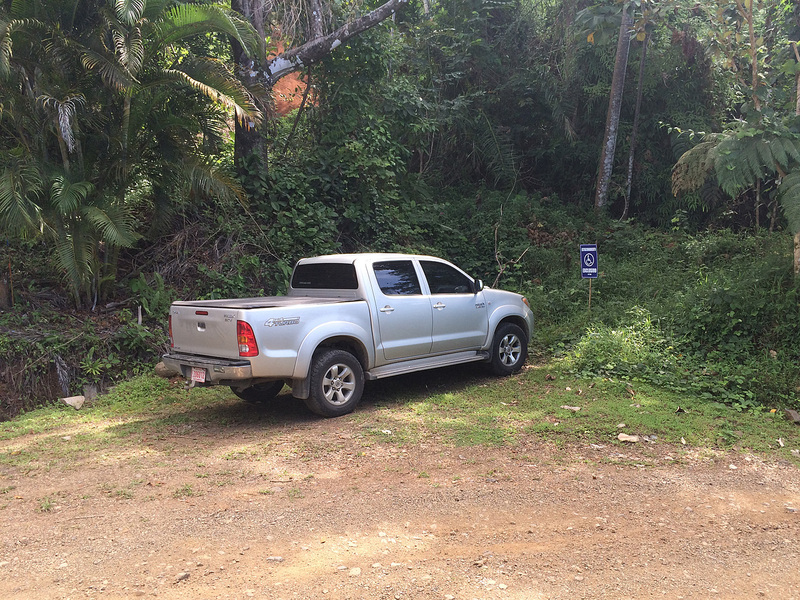 When Eddie drives up to the lot to check on things, he usually parks his truck a little further up at the entrance of another lot that is right below our friends Toni and Gib’s house. Gib is quite the comedian and the ultimate joker. He always has something humorous to add to the conversation and we recently discovered that he likes to pull pranks, too. 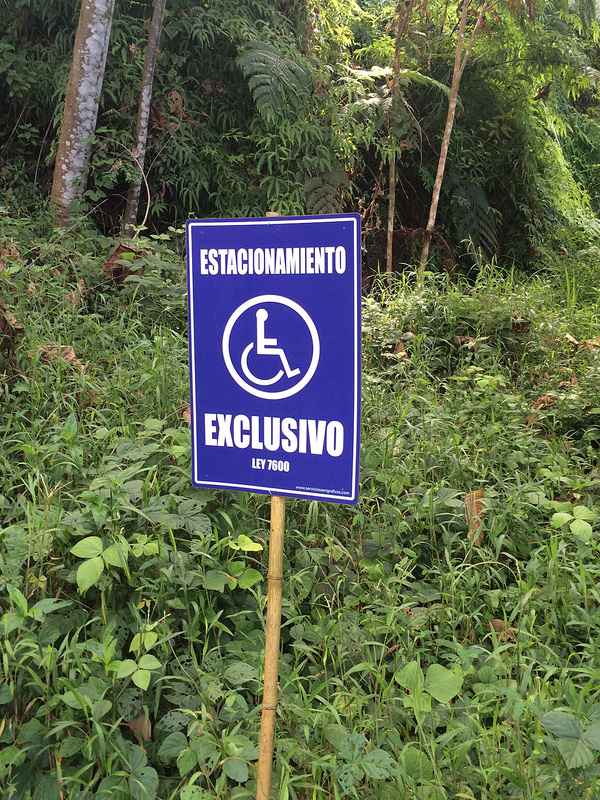 Last week when Eddie pulled up, there was a handicapped sign in front of his parking spot! Wishing everyone a Merry Christmas and a Happy New Year!! !